This rustic side dish is a quick, healthy one pan recipe that's truly fantastic! It's perfect for any night of the week! I love roasting vegetables, especially in cooler months. With just a few ingredients and minimal effort, you can turn something ordinary into something extraordinary. 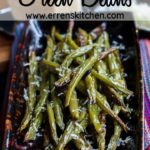 These green beans really are the very best I have ever had and once you’ve tried them, you’ll be making them on a regular basis. The garlic and parmesan cheese add a flavor profile that can’t be beaten. 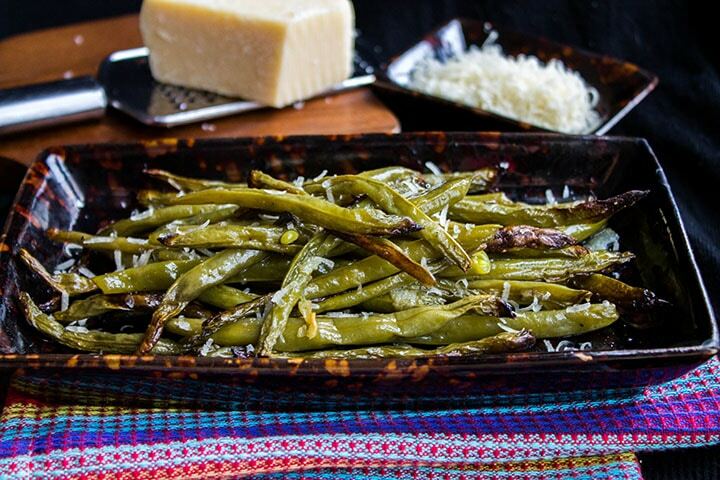 Roasting the green beans gives them a crisp crunch that is not only delicious but healthy too. 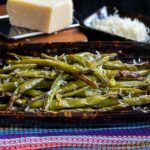 Roasting Fresh green beans is super simple and all you need is 5 Simple ingredients. The short answer – absolutely nothing. 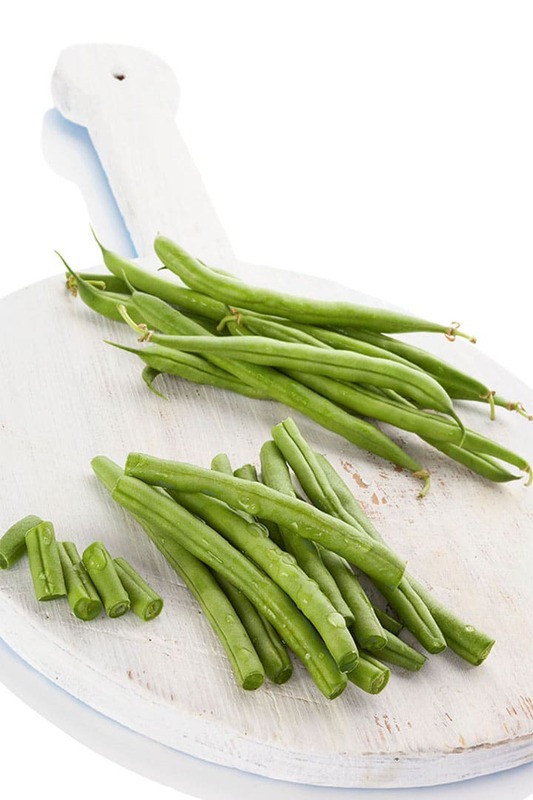 Green Beans and String Beans are the exact same vegetable. It just goes by different names. Trimming green beans is very simple you just cut the ends off on both sides. To easily trim a several at a time, just grab a bunch, line the ends up and cut off the tips in one slice. Then line up the ends and repeat. Start with cleaning and trimming the green beans and add them to a pan. Add thinly sliced garlic, coat with olive oil, and season with salt and pepper. Garlic Hack: I use a garlic slicer to slice my garlic super thin. It’s SO easy and just look at the results below. Click this link to get one on Amazon.com. Or in the UK, Click Here. Add freshly grated parmesan cheese. Roast, until lightly caramelized, crisp and tender, about 15-25 minutes. 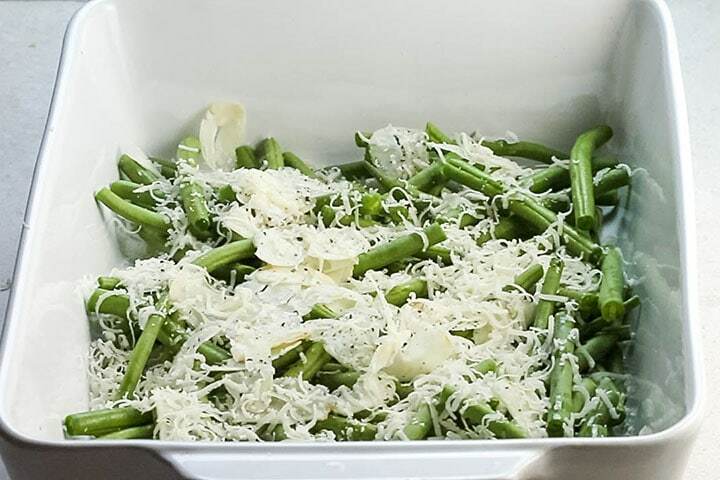 Serve with plenty of freshly grated Parmesan cheese. Be Sure to Preheat the oven. 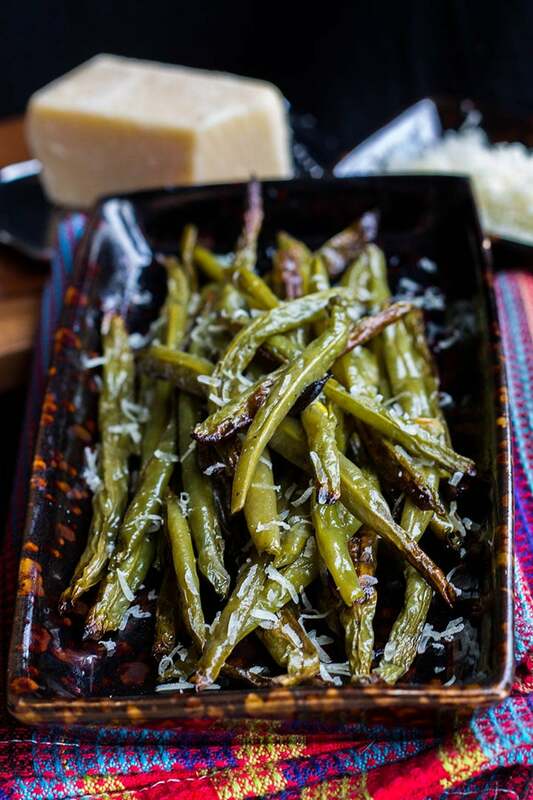 A hot oven from the very start is vital to getting the green beans crispy. Don’t be shy with the oil. Fat is the key to roasting any vegetable. If you don’t use enough oil, the beans will turn out dry. Cut the green beans equal sizes so they cook evenly. Don’t overcrowd the pan. 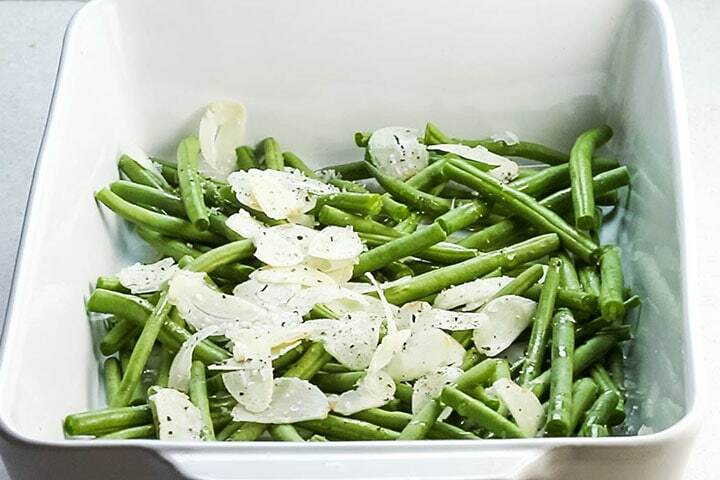 Having a crowded with green beans will result in steaming instead of roasting and they won’t crisp up. 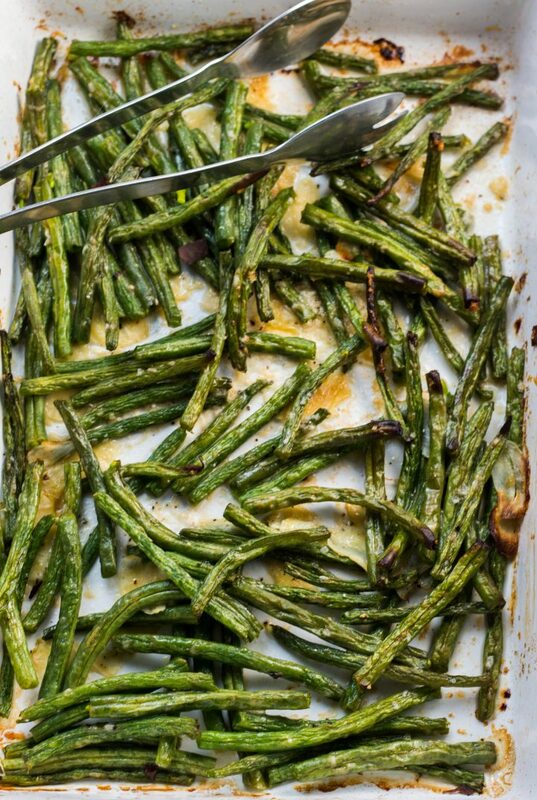 Can Roasted Green Beans Be Made Ahead? 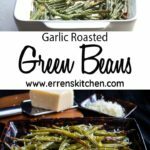 Roasted green beans can be made ahead by preparing them in advance and cooking when ready to serve. 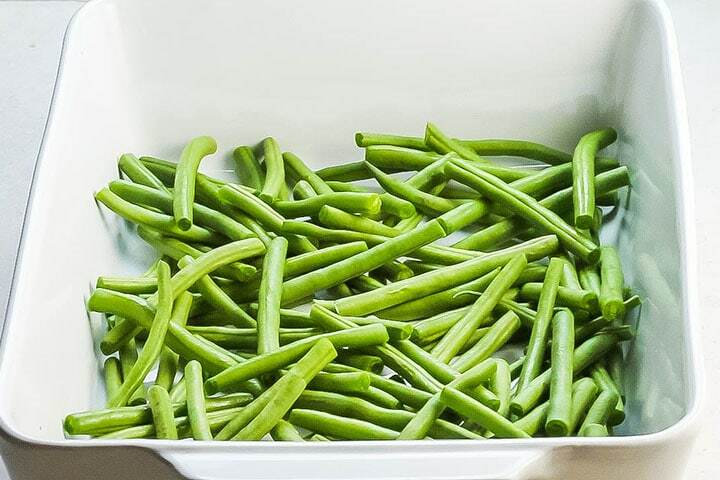 Wash the green beans and leave to dry completely. Trim the ends and add to a large oven safe dish. Add the garlic. Toss with the extra-virgin olive oil, salt, and pepper and spread out evenly in the dish. Don’t overcrowd the pan. 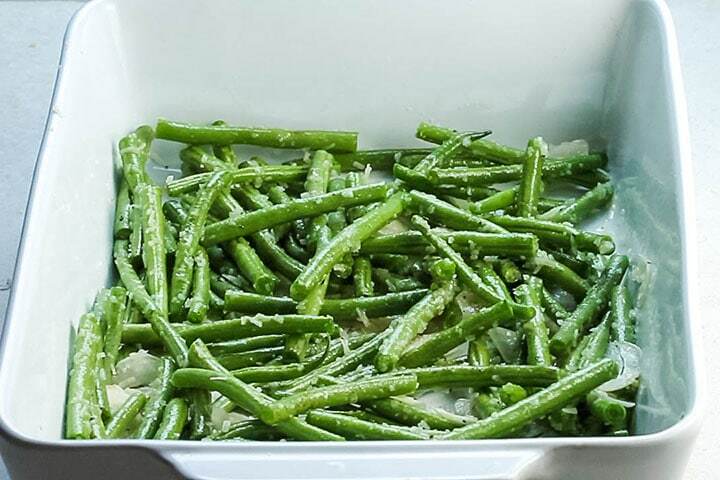 Having a crowded with green beans will result in steaming instead of roasting and they won't crisp up. Update Notes: This recipe was originally posted in 2014, but was published again in 2018 to include step by step directions, nutritional information, new photos, and a video. I have to put this on my menu! So hungry for this!